Was the Flag Raising at Iwo Jima Staged? 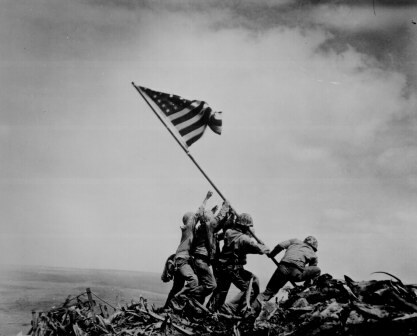 PAUL WALDMAN: We didn’t need the photograph of the Marines raising the flag at Iwo Jima to make us understand that we had won World War II, but it communicated a great deal about what we understood about that event, what it was supposed to represent, what it was supposed to tell us about us. PHILIP GOUREVITCH: The image of Iwo Jima is exactly the opposite. It happens also to be a staged reenactment, as we now know, but it’s an image of American soldiers triumphing over intense adversity at the end of a grueling battle, hoisting their flag in pride over their nation. What you’re talking about is a headshot of Hitler with his brains blown out and showing. We don’t have that. And I don’t think there’s been a failure to achieve closure on World War II in the absence of it. I groaned when I heard this because I teach classes about WWII, but I let it slide. A better blogger would have dropped everything, said good-bye to the wife, and set out to the library to put this sucker in the ground. I am unfortunately not that blogger. The photo was taken after three days of fighting on Iwo Jima. Iwo Jima, I think you will find, sucked. It was a Japanese home island, and it was a fortress of the most formidable type. The Japanese had been preparing it for years, digging caves and tunnels in the volcanic rock and covering every inch of the island with artillery and machine guns, so that there was nowhere safe on the island for an invader. It was a perfect nightmare to attack. A US team could seal one spider hole with explosives, and the Japanese soldier who had been in there would pop up behind you and shoot you from there. All of the artillery and mortars would have been pre-sighted, that is, the Japanese would have placed targets of known size and distance to help them aim quickly, accurately and effectively. Look at this map, which shows the artillery and defensive positions on the island, and then consider that every one of those little dots housed either a machine gun, mortar or high explosive artillery. Iwo Jima was a calculated, engineered hell. Contrary to what Gourevich says, the flag was not raised at the end of the battle, but at the beginning of a month-long struggle on the island. Indeed, only three of the men in the image survived the battle. 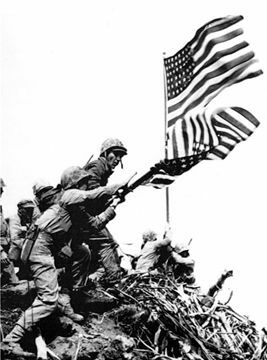 Nonetheless, Iwo Jima was late in the war (Feb-March 1945), when Japan’s defeat was no longer a question. The only question was at what cost would Japan be defeated. As US troops were finally stepping on and taking over a home island, it represented the beginning of a new, final chapter. The only feature to speak of on the entire island was Mt. Suribachi, itself riddled with man-made caves and bunkers. It loomed over the soldiers the entire time, and it must have been discouraging to know that the enemy was spotting you from the heights he commanded. The issue has sparked years of controversy, and we’ve addressed it on the show before. To say the photograph was staged is wrong. However, it was also not of the original triumphal moment. As listener Tim Zinnen wrote, the photo captured the raising of a second flag. Photographer Joe Rosenthal, who took the image, has never disputed that fact. The sequence of events that led to the raising of the flag are fairly well-known, so I am always slightly flummoxed, if flummoxing is what I am getting at, about how this story that the image was posed continues to circulate. I suspect that part of it is that the picture is so damned good–I think it may be one of the most perfect combat photos ever taken. The figures have exquisite triangular composition; the path your eye follows from the flag, down the pole and to the men is as natural as any composition I’ve ever seen. Their task is instantly identifiable, but the men, in a manner consistent with so many combat and military photographs, are almost indistinguishable from one another. They could have been anyone’s brother, father or husband. The image exudes the message of collective, anonymous effort toward a single goal on the verge of completion. So, not all that majestic or anything, but seeing the Americans claim the mountain set off cheers as well as a blaring of horns in the harbor. This second raising was still being carried out under combat conditions not conducive for posing a photograph. Joe Rosenthal, the AP photographer whose photograph would become famous, had missed the initial flag raising and was on the summit shooting photos of the harbor when he saw the men preparing the second raising. The second raising was a planned event, to be sure, and Rosenthal snapped several photos. Rosenthal hadn’t seen his iconic photo (and he in fact may have thought that he missed the shot–he wasn’t even looking through the view finder when he took it). But his reaction to hearing of his photo’s fame, his misapprehension of which photo had been selected, slipped into history and became the foundation of the alternative, unsinkable rumor that remains today. Bradley, James. Flags of Our Fathers. New York: Bantam, 2001. Casaregola, Vincent. Theaters of War: America’s Perceptions of World War II. New York: Palgrave-Macmillan, 2009. See especially, pgs 106-109. This entry was posted on Saturday, June 18th, 2011 at 12:24 pm and is filed under art, history, mass media, Uncategorized. You can follow any responses to this entry through the RSS 2.0 feed. You can leave a response, or trackback from your own site. 24 Responses to Was the Flag Raising at Iwo Jima Staged? Yeah I’ve heard the story too. However since the second raising of the flag was in some sense planned it was to a certain extent “posed”. Although ir was also still largely a “spontanous” event. Still it is a great shot. A few paragraphs later, you mention how Rosenthal thinks it’s the posed photo he took that’s doing the rounds. You then show the posed photo under the flag. So were the combat conditions unfavourable for posed photos or not? Or was the posed photo was taken after the island had been captured? Just what the hell is going on?! The soldiers were still fighting every around the island but those men took but a moment so that they could take a picture together. To probably half of those men it will be the last photo they ever take. In combat conditions it is ALWAYS unfavorable to pose for pictures at the risk of being an easy target for enemy soldiers. Mt.Suribachi was crawling with american soldiers the moment it was captured. Ooh…Good catch! I need to go to work right now, but I’ll make myself more clear about that in the evening, if not sooner! It wasn’t the time or place for the photographer, Joe Rosenthal, to compose the picture, give direction, or “realize the shot that he had designed in his head.” The rows of soldiers going “Yay!”, I think, takes a lot less posing and planning and is spontaneous mugging. So, I think that Rosenthal’s use of the word posed is a little strong in his description. Ok, that’s a fair comment. Oh man, I hate to do this (sort of), but I’ve been looking at that “yay!” pic in more detail and I think you’re a bit off the mark. As a photographer myself, I look at a picture like that and certain things jump out at me. The coastline on the right; the crouching of the guy on the right because there wasn’t enough room off to the right, so he had to crouch so the guy behind him could be seen; the two lines of men creating natural lines leading one’s eye to the flag; the flag blowing perfectly. It would certainly explain why he asked “the posed one?” because that’s the one he remembers since it took some effort for him to set up. I suppose the thing that jumps out at me the most, is that these do not look like men who are under fire. They are at the top of a mountain (the most visible spot on the whole island) and raising their helmets. Would they really do that if the enemy could throw a mortar their way any minute? I don’t know, maybe. Is there any possibility at all that the “yay!” picture was taken once the island was secure? 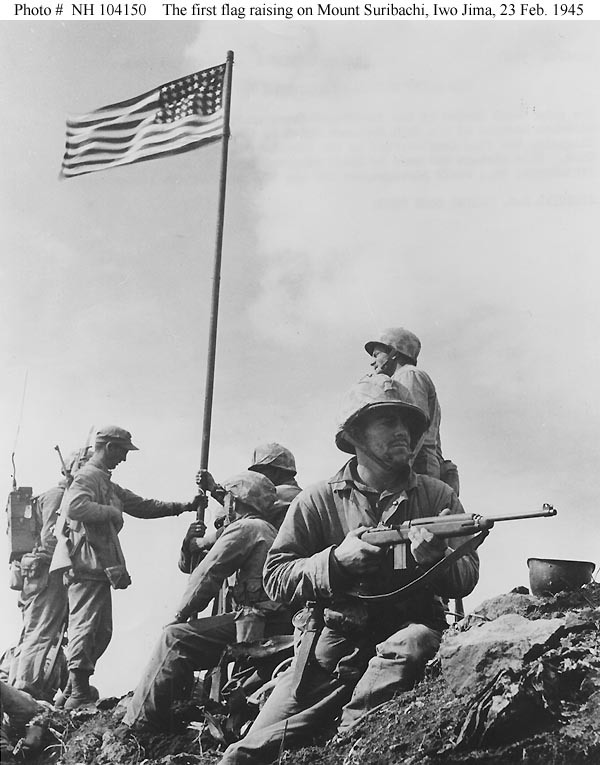 The alternative is that the conditions they were under were indeed conducive for posing, so the argument that he couldn’t set up a posed shot of them erecting the flag because of the possibility of enemy fire isn’t a valid one. I’m not saying that I think the flag raising was posed, by the way. I’m only saying that if the “yay!” pic was taken at the same time, I don’t think that particular line of reasoning is a sound one on which to base the conclusion that the flag raising wasn’t posed. Hell, I know you’re busy; sorry for going on about this. I think the issue is whether they would have taken the risk of getting back up there, again, solely to take pictures. That was not what happened. Taking a few seconds to take a picture under the flag (lining up was something the men were very experienced at doing) and taking the time to trek from a ship to the top of the mountain aren’t comparable. Besides, although they knew they might be fired on, on their way up, they hadn’t been, reportedly because the enemy was being bombarded at the time. It’s my pleasure to help keep you clear and honest, heh. The horror of fighting on Iwo Jima and Okinawa convinced the war department that chemical weapons were necessary in the planned invasion of Kyushu. They expected civilians to fight with ambushes and spears as they did on Okinawa., so civilians were to be gassed. No need to worry about retaliation in kind as Japan did not have stockpiles of gas. Germans had gas, but were in no position to use it and Germany fell before the Kyushu invasion. Starvation, gas, and firebombing would have killed many more Japanese than the atomic bombs did, and the civilian population obeyed the emperors decree that Japanese civilians should not resist. Ira Hayes, one of the Marines in the picture and a fellow Native American, said himself that it was staged to sell war bonds. The man said this himself. This should put it to rest. Sadly, Mr. Hayes died in 1955, therefore I’m afraid he can’t be here to confirm his story. To whom did he say it and where was it published? this is definitely NOT a posed picture. My grandfather is actually in the 2nd flag raising photo. If you Look at the man directly in line with the flag pole, then count him and 2 to the left. The man with his rifle raised, his name is Avis Embrey. That is my grandfather. my grandfather also said, the sad part about this photo was while the second pic was being taken, all the men from the first were running down the hill being killed. I’m confused about this sites motives. It has been known since 1945 that the second photo was taken when the commander wanted a larger flag raised as opposed to the smaller one on the “stick” that was originally raised. At the same time this second picture was taken it was also being filmed. You can call it ” staged” or what ever you like, it doesn’t change the fact that youung American men fought and died at rates you would never understand. That a small group raised up a hill and planted a flag that they loved and were fighting for. All the second gunman conspiracy theory stuff has me scratching my head, what is your point? Did you read past the headline? In the early sixties, a fellow employee who was, in fact, a marine photographer, said that he and four fellow marine photographers took pictures of the initial raising of the small flag as well as the re-do with the bigger flag. He showed me half a dozen pictures of the “raising” for purpose of historical records. BOOTS Thomas from Monticello Florida was one of the flag raisers. HE died on the island several days later. Goggle Boots Thomas Memorial Monticello Florida. This is an excellent article about a topic that’s important to me. The first time I rode past one of the statues made from this photo was my very first car ride, from the Quantico Naval Hospital to the small cabin my parents were renting, off-base.